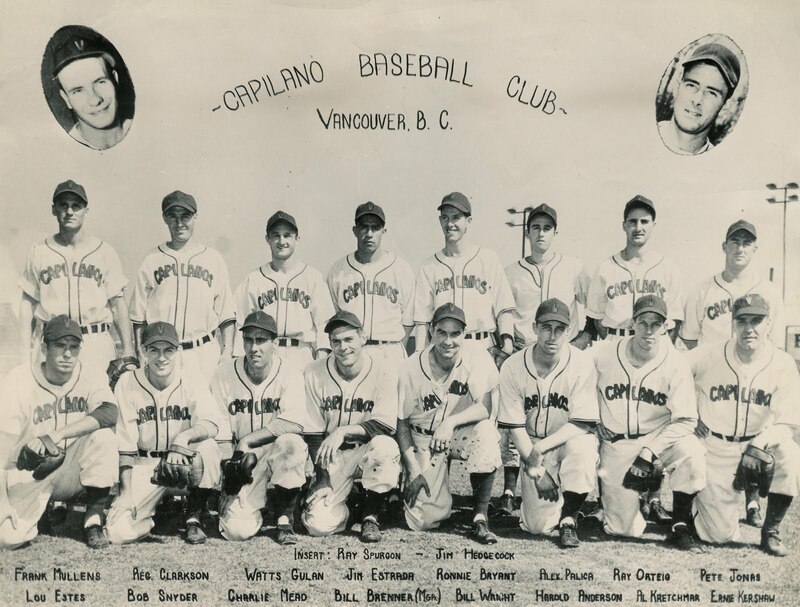 The 1946 Vancouver Capilanos baseball team included hard-hitting outfielder Frank Mullens (back row, far left). Photograph courtesy the David Eskenazi Collection. Frank Mullens patrolled the outfield for the Vancouver Capilanos baseball team before patrolling the streets of Los Angeles as a police officer. Mr. Mullens was one of the athletes who helped revived professional baseball in British Columbia after play was suspended during the Second World War. A veteran of the U.S. Air Force, he came north to play for Bob Brown at old Capilano Stadium at the corner of Fifth Avenue and Hemlock Street in Vancouver. His powerhitting led the Capilanos to the Western International League pennant in 1947. He boasted a .321 batting average with 23 doubles, 5 triples, and 33 home runs that season. 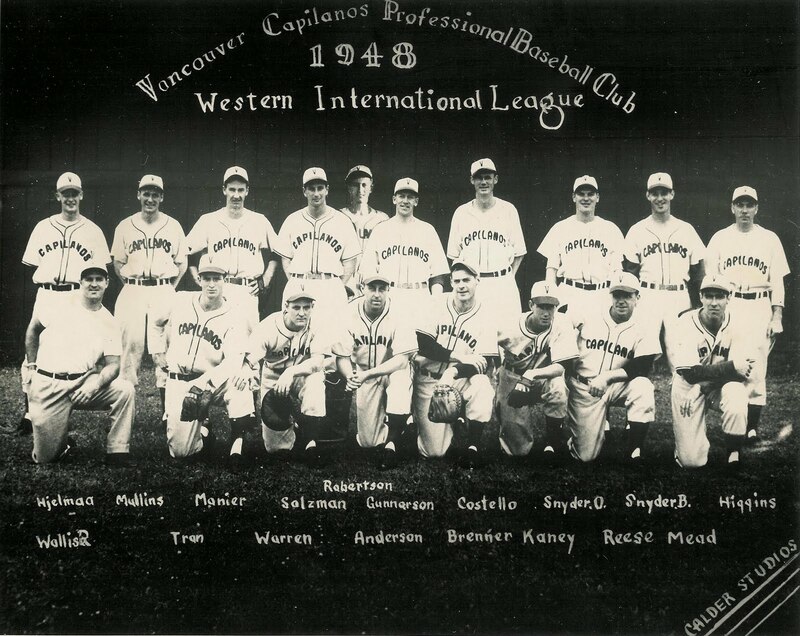 He was named to the Western International League’s all-star team, the only Capilano on the list. The slugging outfielder smacked 70 home runs in three seasons with Vancouver. Mr. Mullens, who also had a reputation for being a good fielder, played parts of two seasons with the Seattle Rainiers of the Pacific Coast League, one level below the major leagues. He abandoned pro ball at age 26 to become a policeman. As head of the narcotics bureau in Van Nuys in the San Fernando Valley, Mr. Mullens decried the number of high school students arrested in 1966 for possession of marijuana. “They seem to have an attitude of acceptance — think it is the thing to do and that there is no stigma attached,” he said. In 1977, when posted as a robbery and homicide officer, Mr. Mullens defused a hostage-taking on the 61st floor of a Los Angeles skyscraper. An armed 21-year-old man protesting the evils of cigarette smoking held a captive for two tense hours before Mr. Mullens convinced him to surrender. The officer received a Medal of Valor, the police department’s highest award for heroism. The medal was bestowed in a ceremony attended by Los Angeles mayor Tom Bradley during which the actor Robert Stack read a dramatic account of the incident. He retired in 1978 with the rank of lieutenant. He then worked for seven years as an investigator for the California State Bar Association. His time with the police department was also notable for two long-distance runs, both of which brought him back to Canada. He joined 11 fellow officers in running relays from Tijuana, Mexico, to Vancouver in 1972, a journey taken in tribute to police killed in the line of duty. Each man ran a 10-mile (16-kilometre) leg each day to complete the winding, 2,068-mile (3,328-km) trek. Four years later, at age 54, Mr. Mullens was the oldest of 14 police runners taking part in a Bicentennial Relay of Goodwill from Los Angeles to Montreal for the Olympics. Mr. Mullens played for many years on the police department’s baseball team. He also coached Little League baseball. An avid woodworker, he built playhouses for elementary school students at Encino, Calif.
Frank Arnold Mullens Jr. was born on March 3, 1922, at Burbank, Calif. He died on March 11 at Thousand Oaks, Calif. He was 88. He leaves Violet, his wife of 53 years; four children; six grandchildren; and, three great-grandchildren. 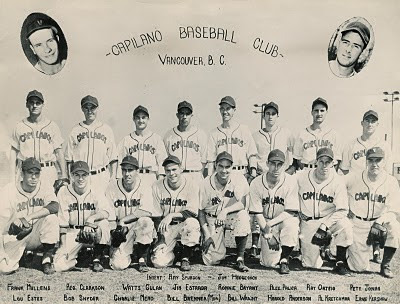 Frank Mullens (back row, second from left) and the 1948 Vancouver Capilanos. Photograph courtesy the David Eskenazi Collection. Thank you for writing about my father. I am proud to call him my Dad and admired his “never give up” attitude. Dad always strived to do his best in all that he endeavored to accomplish, whether Boy Scouts, baseball, policing, running or retirement. I must have heard “if it is worth doing, it is worth doing right” a thousand times. He carried that mantra into his woodworking in retirement and started many projects over because the finished product was not going to be just right. Not a perfectionist, but a craftsman.